I have.been so busy playing and training and cuddling and loving that I forgot to share! You all told me how smart and soft and loving and wonderful Cotons are but I didn't realize you weren't exaggerating! She is so smart and loving and the best dog I ve ever had (so far, haven't had her very long!) I will get a picture posted soon. Did I miss the announcement that u have finally picked up Zooey & brought home? When I took home Simba ( our 17 months coton ) the breader said: comb daily, clean daily the eyes with H3BO3 in 3% water ( boric water in Italian ) untill he changes his teeth after with plain. Never give him red meat ( beef ), just few times white one ( chicken, turkey, etc. )better fish. Still now Simba ( and all his brothers and sisters I see on breeder site ) hasn't any red spot, neither under eyes or mouth. If I see saomething pink appearing I use for a couple of days the boric water and everything works well. Have a great time with your new puppy, it's the better one! Thank you for all of the responses. You had such valuable information on diet and eye grooming. I love the natural approach so really appreciate all of your comments. I agree with Susan - I clean BeBe's eyes daily and use vaseline on the stained areas - it took about 20 days but her eyes are now clean of all stains - I just clipped the old eye hair away and you would never know she had such a problem. I used special scissors with rounded edges too. Now I just add a dab of vaseline in the am and so far so good. When we first got her from the rescue she had stain running from both eyes down her face. In the beginning I used a groomers white cream - that masked the stained area and had a vaseline base that prevented further staining. I purchased it on Amazon and my vet said it was very safe - I liked the product so much that I did a review with pictures you can see that here http://www.amazon.com/gp/customer-media/product-gallery/B00063KGUA/ref=cm_ciu_pdp_images_0?ie=UTF8&index=0 So if you have stains that bother you and can't wait for the vaseline to work - then just pick up some cream - it comes in a little tub, and even though I used it everyday I haven't even put a dent in the supply. When I first got my little cotton she also had eye stains but as she got older it disappeared. But I read in my grooming book for coton de tulears or any white dog with eye stains is to clean around eyes with a warm cotton ball and clean area & if your able to cut some of the hair where its stained that will help use small scissor with blunt ends so you don't poke the eye. Then dry area and get a Qtip and dip alittle vaseline on it and apply starting from corner of eye then on stained area. This helps when the eye tears the vaseline helps from not staining. You would have to make this a routine care until finally the stains disappear. Hope this tip helps anyone who has this problem Good Luck! Moriarty also has eye staining. I see a lot of people talking about diet, but I am not too terribly convinced that really helps. I guess it is possible, but I feed him food from the vet that doesn't have beets or any of that stuff and his eyes still tear up and stain. What I have noticed is hair in the eyes. No matter how short the hair is trimmed around the eyes he always seems to get a long hair, usually from his coat, stuck on his eye. He doesn't seem to mind, but I know it causes enough irritation to make the eye tear up, which then grabs dust and dirt and causes the black-brown stain. The groomer at the vets uses something natural to clean it up every week when he gets groomed, but at year and a half he still has the stains. I keep saline around to flush his eyes when I see he has a hair stuck to one of them. But I will definitely research this diet thing and see if it could be a cause. Beets are a good source of antioxidants. Beets also promote blood flow for circulation. It is a safe veg. to use if u cook for ur dogs as an add on. I use beets when I get migraines which helps them go away naturally. My wonderful Coton, Miss Daisy, is just 5 months old and I researched the eye staining quite a bit before bringing her home. I found that diet seems to be important and so after learning about the deghydrated foods from a friend who owns a pet store I decided to go that route. The food is made by Honest Kitchen. It is made with fruite and vegetables only, no grains or beets, and come with or without the protein such as chicken, beef, turkey, etc. I just buy "Preference" and add my own ground turkey, etc. Miss Daisy loves it and I haven't had any eye stains and her eyes in general stay very clean. You can buy the food online at HonestKitchen.com and they also sell treats. Check it out....it's worth it. A good kibble also is Puppy Advantage by VeRus. It's sold online or at Pets Plus. She is still adorable. U will have to save all these pictures & do a video put to music showing her grow up since u seem good at posting pictures. Which I cannot seem to master making mine small enough to work. I have never used angel eyes I have read both good & concerning info about the product. I do use peroxide & water 10 to 1 to clean under the eyes (idea taken from "Dog Owners Veterinary Handbook"). I use an old saline solution bottle because I can control where I squirt the solution on the fur beneath the eye (avoid eye). I do also keep the hair feathered where it seems to lie & alot of the time I use a dog flea comb since the teeth are close together to comb the feathered hair so it does not pull. OH she is just so precious!! 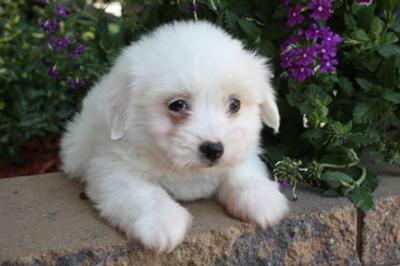 You are going to have so much fun raising a Coton - I have had the pleasure of having 2 in my life - my most recent is BeBe - I went to the animal rescue after the loss of my little Peek China and there she was - a 10 month old Coton! I couldn't believe it. The first Coton I ever had was Jacques, He went to heaven 10 years ago, but he was always in my heart. He was a gift and I loved him more then anything, in his honor I adopted my little Peek, and when she passed away last month I was heartbroken - so when I went into the rescue I was amazed to see BeBe - I feel she was a little gift from my fur babies Jacques and China - lol. My Izzy had the same problem. She was being fed Taste of the Wild from the breeder. I found that this food made her poop stink (she is paper trained) and I switched to Innova Adult Little Bites-- no more stink and no tearing eyes. She still gets dry crud in her tear ducts. Just pick it away daily and she is perfect. You are simply adorable, would love to be able to pick you up and kiss your sweet little cheeks. thank you for the info on angel eyes. i was giving cotton this for several months (not knowing it contained an antibiotic) I had researched it but nothing ever came up like that. anyway, she started refusing anything with it in so she to now gets a little staining. keeping the hair directly under her eyes trimmed really short does help. I also wash under her eyes almost daily with a warm cotton ball, that keeps what hair is there from becoming stiff and irratating. Good luck with her, she is a real sweetie. My puppy also had a lot of staining. What helped was trimming hair around her eyes (at 4 months), but also I changed her diet and do not give her food with grains or beet (dry orijen and meat for puppies). That helped enourmously and she has not have any staining since tne. Of course, it took few weeks for the staining to disappear completely. Maybe that will help.